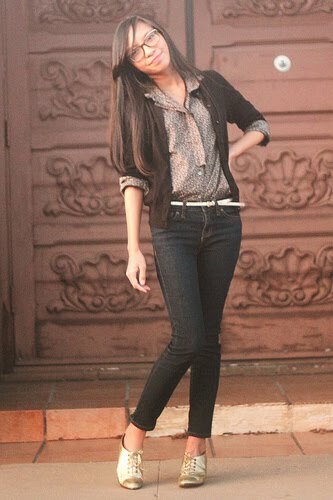 I get a lot of fashion inspiration from fellow style bloggers and street style blogs. I like to see real people, what clothes they collect, and how they assemble them into outfits. To me, there is just so much personality there. Other than blogs, J.Crew's spring catalogs always inspire me (although that is not necessarily a "who"). I wear springy clothes all year round because I love the colors, and well, because I live in Arizona. And this will sound obscure, but Connie Wang, editor of Refinery29 also inspires me. She mixes different styles, textures, and colors in a way that I haven't found in anyone else. I always jump for joy when they have their "What We're Wearing" articles. Oh yeah, and I really like Kirsten Dunst and Kate Bosworth if we're talking about celebrity style. I would say my iPhone, but now that I think of it, it is usually in my hand or in my pocket! So I would probably say my MAC lipstick in 'Spice It Up" and DuWop lipgloss in "Tulip". I really love the high-waisted, full skirt look - I think it just creates such a pretty, feminine silhouette. Minimalism. I'm just a big fan of the use of bold, bright colors, so the minimalism trend doesn't resonate too well with me. Well, I started my blog a few years ago, and it was more of a lifestyle blog for a while. Just a hodge podge of things I liked. I had always wanted to get into style blogging, though. My personal style is something that I am incredibly passionate about, and I thought I could bring my own perspective to the "everyday outfit" type of blogging. However, I didn't really have the confidence to do it until November 2010, when two people I admire encouraged me to do it. From that moment, I just said, that's it. I'm doing this. Classic with a quirky twist. When getting dressed, I always ask myself, "Is there something quirky about this?" Now, quirky can have different meanings on different days - usually I like when something is a bit 'off' or when something is contradicting, whether it be patterns, styles, colors, etc. Modesty is also an important element to me. This isn't really specific to winter (winter doesn't exist in Arizona! ), but I'm really wanting brown lace-up peep-toe slingback oxfords. Specifically, these ones from Madewell. I've had this page open on my browser for the past two days, just so I could behold their glory at any given moment. Definitely a shoes girl. I am extremely picky with bags, so it is hard for me to find one that I truly love. Once I find one, I stick with it. Shoes on the other hand... I would collect shoes like crazy if I could. Clogs. Which is funny, because I noticed a lot of the other Girls of the Blogosphere also had negative things to say about them. I purchased a pair on sale for about $20 to see if I could work with them. But they just weren't very flattering to my feet, and it sounded like my feet were bricks. My favorite place I've been to so far is Salzburg, Austria. My husband and I honeymooned there just last September. It was an absolutely gorgeous, historic city that really keeps its authenticity. I am also a big fan of the Sound of Music, so we were able to take a tour of the sights that are featured in that film. I would absolutely love to visit Thailand or Iceland, though! I can hula hoop forever. Look of the Week: Who Needs a Jacket? I like to have fun with my nail colours and manicures and I am not afraid to wear crazy colours. I noticed while watching Pretty Little Liars (don't judge me), Hanna had a black and red manicure which I thought looked pretty awesome. While living in Korea I saw many girls who painted each nail a different colour, something I have never tried but plan on doing so in the near future. 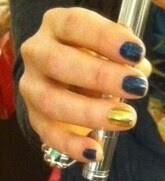 The other day @Berdorfs tweeted this photo and I fell in love with her manicure. 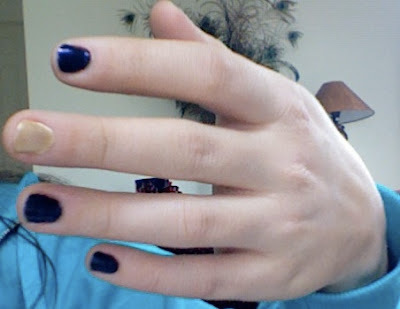 I decided to give it a try on my own nails using a gold polish from Joe Fresh and a metallic blue from a Korean brand called The Face Shop. My gold isn't quite as powerful as I'd like and it looks even more subtle and washed out in this photo than it is in real life but I was working with what I had.